Media and Contents: Soft-cover(?) book of 131 pages with 100+ black & white photographs and a number of high quality scale drawings and colour profiles. The ASJA/SAAB Sk 14 was the standard advanced trainer of the Swedish air force in the 1940s. 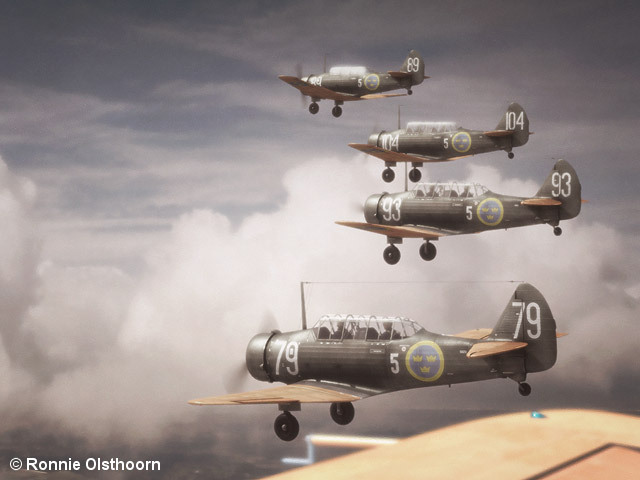 Although relatively unknown outside Sweden, the Sk 14 was in fact a member of the enormous family of North American trainer aircraft, that started with the NA-16 and had world-famous members such as the Harvard and AT-6 Texan. Having created the cover art for this book, I was fortunate enough to be able to read it in digital format, before it actually went into print. Written by Doug MacPhail (an authority on the NA-16/Harvard/Texan aircraft family) and co-author Mikael Östberg, it is undoubtedly the best reference work ever written about this aircraft. The style of the book is very to-the-point, yet light to read and very informative. It is build up in a more or less chronological order. The book starts off with a description of how the Swedish air force sought for an advanced trainer, and found their match in North American’s NA-16. It explains how after this the production in Sweden was set up and how it was troubled by embargoes, caused by the Second World War. A forced engine change led to a second variant of the Sk 14, and the consequences of this surgery, both in production as during its operational career, provides a very interesting read. The same can be said of the stories of the several projects based on the Sk 14 that are described next. A detailed account on the recent ‘restoration’ of an Sk 14 is followed by an in-depth research into the colours and markings of the Sk 14. The book concludes with several stories of remarkable events in the service life of the Sk 14, including the ‘victory’ over a Luftwaffe machine. Modellers will be please to note that a large section of the book is devoted to them. This section includes many good reference and detail photos, scale drawings, Östberg’s excellent colour profiles and the earlier mentioned description of marking and colours. For Swedish speaking readers, the book has a condensed 19-page Swedish translation in the back, which includes all photo captions as well. This book appears to be extremely well researched. All information in the book is backed up by facts, which gives the whole work a very solid feeling. The 131 pages of this book pack an enormous amount of information and provide a satisfying read. To me, the humble sub-title “A Pictorial Essay” doesn’t quite cover the contents of the book. 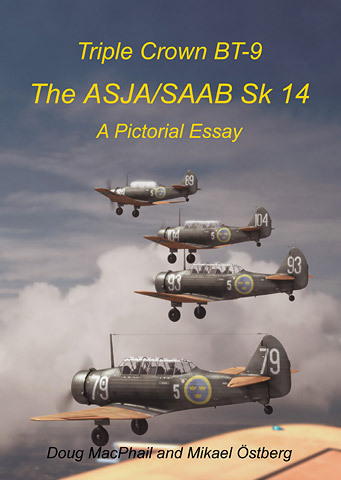 Modellers will enjoy this book as it contains good information on Swedish air force wartime markings and great drawings, profiles and detail photos of the Sk 14. They will be interested to know that Azur’s 1/72 kit of the NAA-57 makes a pretty accurate Sk 14, almost straight out of the box. Decals for Swedish air force markings can be found through Rebell Hobby ( http://www.rebell.com ). Despite the lesser-known subject, this book should appeal to those interested in World War II training aircraft in general, and the Swedish air force in particular. For true fans of the Harvard/Texan family, it’s a must have. At just $25 it’s good value for money too.